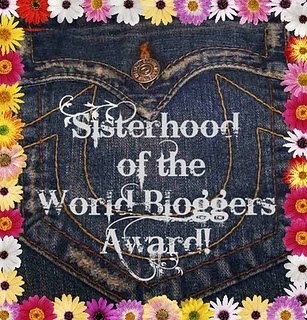 Deelicious Sweets: Sisterhood of the World Bloggers Award! Deelicious Sweets was given an award by her blogger friend Cultural Dish! Isn't she just the best! Go give her some love - Cultural Dish! She is a new blogger friend and she likes Guinness just about as much as I do. It was a blogger match made in heaven! Thank you Cultural Dish!! As a recipient of this award, I am supposed to not only repeatedly thank Cultural Dish for giving it to me, but I am supposed to share 7 things about myself and then pass the award on to 15 other bloggers that I have come to love! I am part Potawatomi Indian. I am claustrophobic - I believe in my past life, I must have been buried alive. I can't even watch shows on TV when they crawl through tight spaces. I had a fear of heights until I decided to overcome them and go mountain climbing while in Colorado over the summer. Maybe I should go spelunking to overcome my claustrophobia. I hate staying in one place. If I had the choice, I would live all over the world. I believe I am missing out and letting life pass me by. I was a gypsy in my past life, that was buried alive! I lure stray animals in to my home and take them to the Humane society to see if they are micro-chipped and bring them back home. So far so good. I can sew, cross stitch, cook, bake, clean and organize. I am very domestic. It's so hard to just pick 15 bloggers who deserve this award! There are so many who deserve it! Three Friends Who Love to Cook! Thanks again to Cultural Dish! Congrats on your award as it is very well deserved! You are so sweet to think of me in this fabulous list of awesome foodies thank you so much! I am honored! I love fact number 5! I'm pretty antsy myself and would love to move around. WOW I just found this! Thanks so much Dee. It means the world to me. Wow I am just so happy right now. Thank you thank you!